The Nutcracker Ballet is a picture, with genre photograph. Its dimensions are 2.8 in. x 5.6 in.. It was created on Saturday, December 14, 1996. Worthington Civic Ballet is the Creator. Worthington Libraries is the Contributor. Barbara Albright (née Burrows), 1945-2003 is the Choreographer. 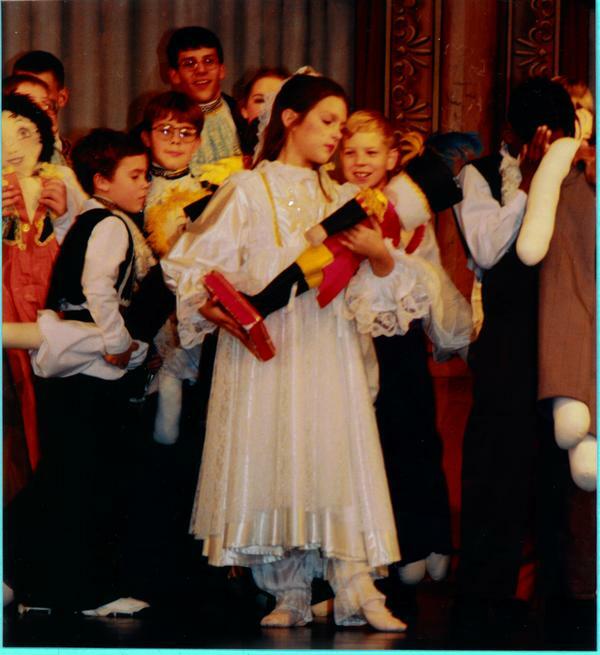 A scene from "The Nutcracker" ballet performed by the Worthington Civic Ballet and Youtheatre is depicted here. The ballet featured a cast from the local dance company with Brianna Lombardi in the role of Clara, Patrick Rohrer as Fritz, and Eric Sweeney as Uncle Drosselmeyer. Guest soloists from the Fasting-Farquhar Capital City Ballet included D.J. Schaeffer as the Nutcracker Prince, as well as Sarah Kimball, Jessica Davidson, Nancy Morcos, and Steve Loxce. Barbara Burrows, director of the Worthington Civic Ballet, choreographed the production and made the costumes. It covers the topics art, ballet and dance. You can find the original at Worthington Libraries. The Worthington Memory identification code is wcb0018_002. This metadata record was human prepared by Worthington Libraries on November 4, 2004. It was last updated October 20, 2017. The holiday season is upon us! This month's exhibit gives a nod to the ways, both traditional and unique, that Worthington residents through the decades have celebrated this special time of year.